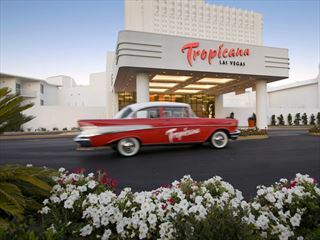 You may not believe your eyes upon encountering a tropical oasis in the desert, but this hotel is no mirage – it’s The Mirage on the Las Vegas Strip. Timeless beauty, tropical surroundings and exceptional service make The Mirage one of the most beloved hotels in the city. With nicely appointed rooms, numerous restaurants, a 20,000-gallon saltwater aquarium and entertainment which is second-to-none, The Mirage has it all. Located on the Las Vegas Strip, set amidst lush foliage, towering waterfalls and sparkling lagoons, The Mirage is a South Seas oasis, offering the serenity of the tropics and the excitement of Las Vegas. 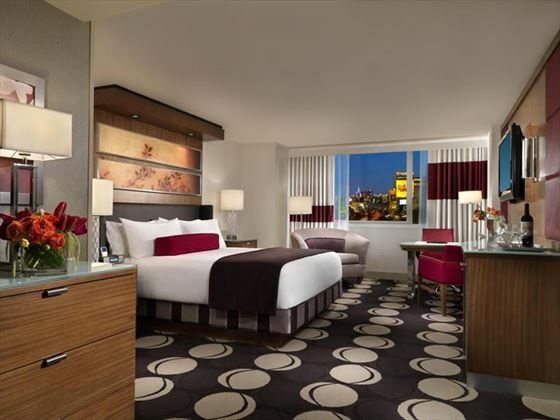 The Mirage’s 3,044 guest rooms feature rich hues and imported fabrics in a refined atmosphere of sophisticated comfort. Many are available with breath-taking views of the tropical pool, majestic mountains or Las Vegas Strip, with ultra-modern amenities. The hotel offers a fantastic range of amenities, a fabulous large pool with waterfalls and lagoons, the Secret Garden & Dolphin habitat, therapeutic treatments at The Spa, a modern fitness centre, shopping and a dedicated concierge to organise trips, tours and reservations. You don’t have to go far to find somewhere to eat, The Mirage offers 10 fantastic restaurants, serving a range of tasty international cuisine, 5 bars - all with different styles and speciality drinks and the 1 Oak, a lively nightclub. Enjoy a range of various artists and performers every month, with year-round shows from Terry Fator, Boyz II Men and The Beatles LOVE, Cirque Du Soleil’s interpretation of their legacy. The Mirage Casino offers all the favourites, whether you’re a serious player or novice you’re sure to enjoy the selection of lively table games, race & sports book, slot machines and poker. Located on the Las Vegas Strip, set amidst lush foliage, towering waterfalls and sparkling lagoons, The Mirage is a South Seas oasis, offering the serenity of the tropics and the excitement of Las Vegas. Experience an exotic, enchanting and wondrous world at Siegfried & Roy’s Secret Garden and Dolphin Habitat and come face to face with white lions, white tigers, panthers, leopards, Atlantic bottlenose dolphins and the latest additions – an adorable litter of tiger cubs and new baby dolphin! Known the world over for its iconic Strip-front feature, The Mirage has joined forces with legendary Grateful Dead drummer Mickey Hart, Indian tabla sensation Zakir Hussain and Fountains of Bellagio design firm WET to create an all-new audio/visual spectacle. Erupting Nightly Come See the New Volcano! One of the most popular attractions is the aquarium located behind the front desk. This 20,000-gallon saltwater aquarium is home to angelfish, puffer fish, tangs and other exotic sea creatures. LOVE brings the magic of Cirque du Soleil together with the spirit and passion of The Beatles to create an intimate and powerful entertainment experience. With LOVE, Cirque du Soleil celebrates the musical legacy of The Beatles through their timeless, original recordings. He captured the hearts...and funny bones...of America with his rousing victory on "America’s Got Talent." 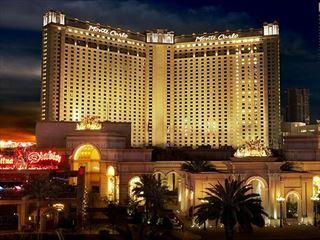 Now, Terry Fator brings his hilarious live show to The Mirage in Terry Fator & His Cast of Thousands.